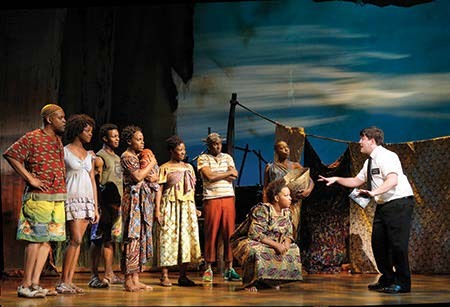 In an atypical plot, a pair of Salt Lake City missionaries, Elder Price (Mark Evans) and Cunningham (Christopher John O’Neill), are sent to Uganda to convert the AIDS and poverty plagued locals to Mormonism. 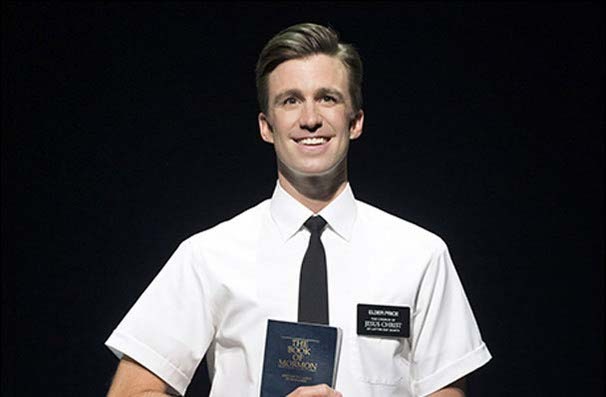 The overachieving Elder Price wanted to be sent to Orlando and Cunningham just wanted to have a real friend and be accepted by others. The missionaries, played with convincing fervor, are like fish out of holy water. Their faith is shaken by warlords, disease, and violence. They eventually fulfill their destiny with the help of cameos appearances by Jesus, Joseph Smith, Darth Vader, Hitler, and Johnny Cochran. 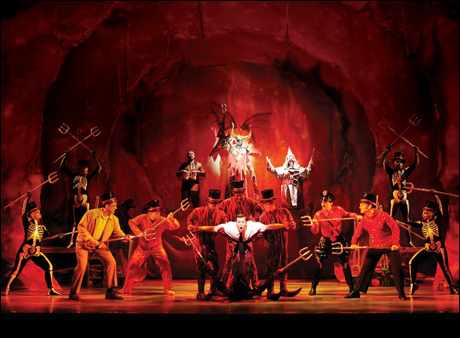 The highlight of the night was the Spooky Mormon Hell Dream where Elder Price finds himself dreaming that he’s in the midst of Hades’ flames with the likes of Adolf Hitler and Johnny Cochran. Not only did it lend itself to hysterical laughter, but the dancing incorporated detailed, distorted moves that were stunning to watch. As the daemons moved in unison, I was mesmerized by their grace an fluidity, even if it was surrounded by the fiery flames of Hell. The tuneful songs were also one hit after another. Turn It Off was especially brilliant. 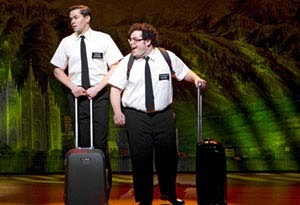 As Elder McKinley leads the missionaries in “our nifty little Mormon trick” to suppress inconvenient feelings with no more effort than the flick of a light switch, I was shocked by the musical talent and the tap dancing number performed with ease. I can’t imagine the difficulty in performing such elaborate, physically demanding numbers while maintaining perfect pitch and tone. It takes immeasurable amounts of talent and skill. Another outstanding musical performance is by Samantha Marie Ware, playing the Ugandan Nabulungi. She brings tremendous musical firepower to Sal Tlay Ka Siti, her impossible dream of a civilized existence in the Mormons’ headquarters city, Salt Lake City. To sum up all of the inappropriateness was a grand finale Ugandan reenactment of Cunningham’s teaching including large, black strap-on props, a “stuffed” (in more ways than one) frog, and creative visuals of parts of the female anatomy on a man’s face. I was so shocked at the jaw-dropping actions that I scoured the theater for disapproving eyes. To my surprise, there wasn’t an unhappy, unsmiling face n the crowd. It was well-received and taken in fun. 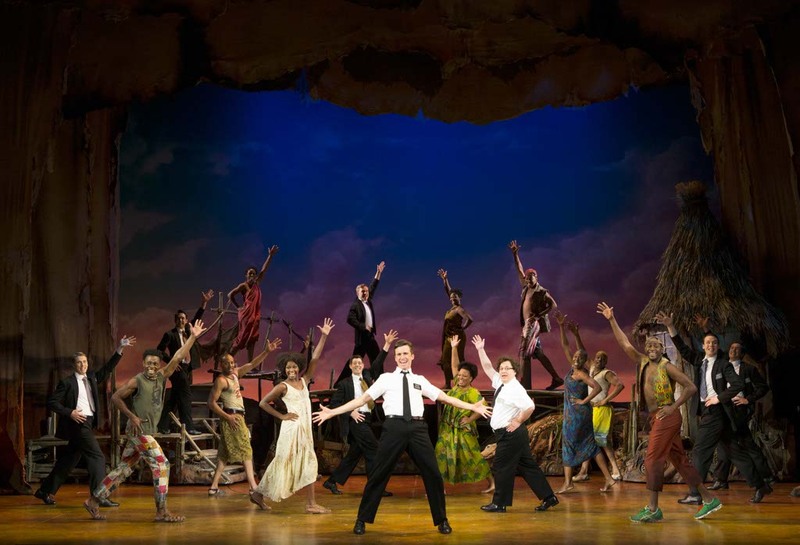 The Book of Mormon was pee-in-my-pants funny, outrageous, and over-the-top shocking, which I expected, but what I didn’t expect was the superbly energetic dancing, award-winning, catchy tunes, and elaborate costumes and sets. It’s a hit; it’s proof that a whole lot of wrongs do actually make a right. I just tried to get tickets but it is completely sold out! It must be awesome. Maybe next time or when I am traveling. I vaguely heard about this but was never really sure what it was about. I definitely want to see it now. It is my type of humor. Looking forward to reading more of your experiences with theater. Finally a musical that I would like to see. This is one I will take my wife to.